Dr. Rigoli graduated in Psychology at the University of Florence (2005), followed by a master in Cognitive Psychology at the University of Bologna (2007). He finished his PhD in Cognitive Sciences at the University of Siena (2012). Part of the PhD was at the National Research Council of Italy (Rome) and at the Cognition and Brain Sciences Unit in Cambridge (UK). 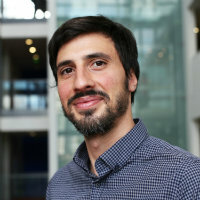 Before taking up a permanent faculty position at City University London, Dr. Rigoli was a post-doc at the Wellcome Trust Centre for Neuroimaging at UCL (from 2012 to 2016). Dr. Rigoli's research focuses on the study of decision-making, motivation and adaptive behaviour using a multidisciplinary approach which combines behavioural experiments, neurophysiological methodologies (especially functional MRI), and computational modelling. Dr Rigoli would welcome enquiries from potential PhD students. Rigoli, F., Michely, J., Friston, K.J. and Dolan, R.J. (2019). The role of the hippocampus in weighting expectations during inference under uncertainty. Cortex, 115, pp. 1–14. doi:10.1016/j.cortex.2019.01.005 . Rigoli, F. and Dolan, R. (2018). Better than expected: The influence of option expectations during decision-making. Proceedings of the Royal Society B: Biological Sciences, 285(1893). doi:10.1098/rspb.2018.2472 . Fiore, V.G., Nolte, T., Rigoli, F., Smittenaar, P., Gu, X. and Dolan, R.J. (2018). Value encoding in the globus pallidus: fMRI reveals an interaction effect between reward and dopamine drive. NeuroImage, 173, pp. 249–257. doi:10.1016/j.neuroimage.2018.02.048 . Pezzulo, G., Rigoli, F. and Friston, K.J. (2018). Hierarchical Active Inference: A Theory of Motivated Control. TRENDS IN COGNITIVE SCIENCES, 22(4), pp. 294–306. doi:10.1016/j.tics.2018.01.009 . Rigoli, F., Preller, K.H. and Dolan, R.J. (2018). Risk preference and choice stochasticity during decisions for other people. COGNITIVE AFFECTIVE & BEHAVIORAL NEUROSCIENCE, 18(2), pp. 331–341. doi:10.3758/s13415-018-0572-x . Martinelli, C., Rigoli, F., Averbeck, B. and Shergill, S.S. (2018). The value of novelty in schizophrenia. Schizophrenia Research, 192, pp. 287–293. doi:10.1016/j.schres.2017.05.007 . Rigoli, F., Chew, B., Dayan, P. and Dolan, R.J. (2018). Learning Contextual Reward Expectations for Value Adaptation. Journal of Cognitive Neuroscience, 30(1), pp. 50–69. doi:10.1162/jocn_a_01191 . Martinelli, C., Rigoli, F., Dolan, R.J. and Shergill, S.S. (2018). Decreased value-sensitivity in schizophrenia. Psychiatry Research, 259, pp. 295–301. doi:10.1016/j.psychres.2017.10.031 . Rigoli, F., Mathys, C., Friston, K.J. and Dolan, R.J. (2017). A unifying Bayesian account of contextual effects in value-based choice. PLoS Computational Biology, 13(10). doi:10.1371/journal.pcbi.1005769 . Rigoli, F., Pezzulo, G., Dolan, R. and Friston, K. (2017). A Goal-Directed Bayesian Framework for Categorization. Frontiers in Psychology, 8. doi:10.3389/fpsyg.2017.00408 . Martinelli, C., Rigoli, F. and Shergill, S. (2017). Aberrant force processing in schozophrenia. Schizophrenia Bulletin, 43(2), pp. 417–424. Friston, K., FitzGerald, T., Rigoli, F., Schwartenbeck, P. and Pezzulo, G. (2017). Active Inference: A Process Theory. Neural Computation, 29(1), pp. 1–49. doi:10.1162/neco_a_00912 . Rigoli, F., Friston, K.J. and Dolan, R.J. (2016). Neural processes mediating contextual influences on human choice behaviour. Nature Communications, 7(1). doi:10.1038/ncomms12416 . Rigoli, F., Rutledge, R.B., Chew, B., Ousdal, O.T., Dayan, P. and Dolan, R.J. (2016). Dopamine Increases a Value-Independent Gambling Propensity. Neuropsychopharmacology, 41(11), pp. 2658–2667. doi:10.1038/npp.2016.68 . Fiore, V.G., Rigoli, F., Stenner, M.-.P., Zaehle, T., Hirth, F., Heinze, H.-.J. … Dolan, R.J. (2016). Changing pattern in the basal ganglia: motor switching under reduced dopaminergic drive. Scientific Reports, 6(1). doi:10.1038/srep23327 . Rigoli, F., Chew, B., Dayan, P. and Dolan, R.J. (2016). The Dopaminergic Midbrain Mediates an Effect of Average Reward on Pavlovian Vigor. Journal of Cognitive Neuroscience, 28(9), pp. 1303–1317. doi:10.1162/jocn_a_00972 . Friston, K., FitzGerald, T., Rigoli, F., Schwartenbeck, P., O⿿Doherty, J. and Pezzulo, G. (2016). Active inference and learning. Neuroscience & Biobehavioral Reviews, 68, pp. 862–879. doi:10.1016/j.neubiorev.2016.06.022 . Pezzulo, G., Cartoni, E., Rigoli, F., Pio-Lopez, L. and Friston, K. (2016). Active Inference, epistemic value, and vicarious trial and error. Learning & Memory, 23(7), pp. 322–338. doi:10.1101/lm.041780.116 . Rigoli, F., Chew, B., Dayan, P. and Dolan, R.J. (2016). Multiple value signals in dopaminergic midbrain and their role in avoidance contexts. NeuroImage, 135, pp. 197–203. doi:10.1016/j.neuroimage.2016.04.062 . Rigoli, F., Friston, K.J., Martinelli, C., Selaković, M., Shergill, S.S. and Dolan, R.J. (2016). A Bayesian model of context-sensitive value attribution. eLife, 5(JUN2016). doi:10.7554/eLife.16127 . Rigoli, F., Rutledge, R.B., Dayan, P. and Dolan, R.J. (2016). The influence of contextual reward statistics on risk preference. NeuroImage, 128, pp. 74–84. doi:10.1016/j.neuroimage.2015.12.016 . Rigoli, F., Ewbank, M., Dalgleish, T. and Calder, A. (2016). Threat visibility modulates the defensive brain circuit underlying fear and anxiety. Neuroscience Letters, 612, pp. 7–13. doi:10.1016/j.neulet.2015.11.026 . Rigoli, F., Pezzulo, G. and Dolan, R.J. (2016). Prospective and Pavlovian mechanisms in aversive behaviour. Cognition, 146, pp. 415–425. doi:10.1016/j.cognition.2015.10.017 . Pezzulo, G., Rigoli, F. and Friston, K. (2015). Active Inference, homeostatic regulation and adaptive behavioural control. Progress in Neurobiology, 134, pp. 17–35. doi:10.1016/j.pneurobio.2015.09.001 . Friston, K., Rigoli, F., Ognibene, D., Mathys, C., Fitzgerald, T. and Pezzulo, G. (2015). Active inference and epistemic value. Cognitive Neuroscience, 6(4), pp. 187–214. doi:10.1080/17588928.2015.1020053 . Pezzulo, G., Rigoli, F. and Chersi, F. (2013). The Mixed Instrumental Controller: Using Value of Information to Combine Habitual Choice and Mental Simulation. Frontiers in Psychology, 4. doi:10.3389/fpsyg.2013.00092 . Rigoli, F., Pavone, E.F. and Pezzulo, G. (2012). Aversive Pavlovian Responses Affect Human Instrumental Motor Performance. Frontiers in Neuroscience, 6. doi:10.3389/fnins.2012.00134 . Pezzulo, G. and Rigoli, F. (2011). The Value of Foresight: How Prospection Affects Decision-Making. Frontiers in Neuroscience, 5. doi:10.3389/fnins.2011.00079 .